I love granola bars of all varieties and flavors. Chewy, prosthesis crunchy, thumb nutty and fruity. I used to stock up at the grocery store weekly, but then I looked at the list of ingredients. Far too many processed food-like substances for my taste, so I decided to make my own. I posted a recipe for Banana Chocolate bars over the summer and haven’t bought a box of granola bars since. The recipe was a huge success and I’ve been meaning to post follow-up varieties, but haven’t been all that inspired. Now that it’s fall and everything is cranberries, cinnamon and nutmeg, I’ve finally found the inspiration I was looking for. 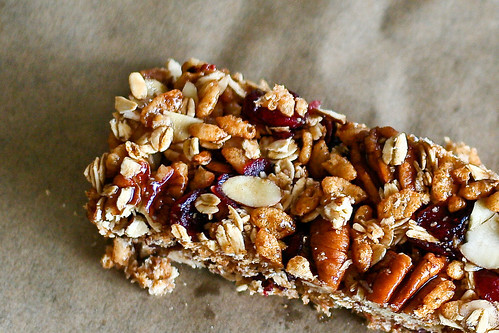 These Cranberry Spice granola bars taste just like the Autumn. Tom thinks they taste like Pumpkin Pie, but he thinks that about everything made with nutmeg. While the recipe and method are almost identical to the summer’s granola bars, the mix-ins give them a unique flavor all their own. Instead of chocolate, cashews and banana chips, I used dried cranberries, pecans and a blend of warming spices, including cinnamon, nutmeg, cardamom and ginger. I encourage you to give these granola bars a try. They come together in under 20 minutes, everyone loves them and you can experiment with a huge variety of nuts and mix-ins to make them your own. They also make a filling and nutritious portable snack. Since most airlines don’t even give you a tiny bag of pretzels, I made these for Tom’s business trip and I think they just might be the perfect carry-on plane food. These keep in the fridge for a week or two. You can also keep them out on the counter since it’s not too warm out. Preheat the oven to 325Â°. Spread the almonds and pecans on a cookie sheet and toast them in the oven for 6 – 8 minutes, or until they start to brown a bit. In the meantime, grease a 9 x 13 baking dish with the butter and set aside. Now, mix the oats, rice cereal, cranberries and toasted almonds and pecans in a big bowl. In a small saucepan, heat the syrups, salt, cinnamon, nutmeg, cardamom, ginger and vanilla extract over medium-high heat, stirring to avoid burning. Once the syrups come to a light boil, continue to cook for an additional 3 – 5 minutes until the syrup begins to thicken, then pour it over the oats and nuts. Mix everything together so that the syrup evenly coats everything in the bowl. While itâ€™s still warm, pour the contents of the bowl into your prepared baking dish. Using a rubber spatula, pat everything down so itâ€™s nice and compacted. I like to place some parchment or aluminum paper over the top and really press down so that the bars don’t break apart when you eat them. Let cool to room temperature. You can also put them in the fridge for a bit since thisâ€™ll make cutting easier. Cut them into square or rectangles as you please. 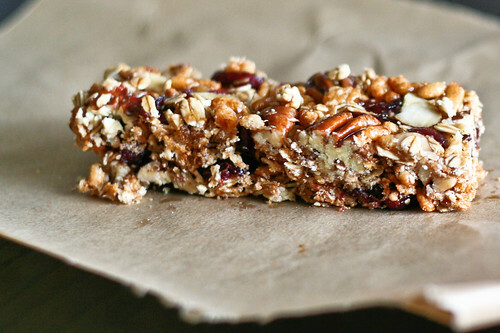 Makes about 18 granola bar-sized bars. Mel – perfect timing. I have dried cranberries, pecans, oats and almonds all sitting around taunting me to find ways to use them up. This will be the perfect solution because I agree – we both love granola bars but the ones from the store are either way too pricey or loaded with junk. Two questions. Do you think I could sub in organic multigrain squares (they are pretty small) for the rice crisps and use agave rather than brown rice syrup? Wow thanks – I didn’t know that about the rice syrup – very helpful. I’ll pick some up tomorrow or Sunday and get the bars going. It is quite a bit cooler here – afternoon highs in the low 70s and evening lows in the low 50s. Not exactly cold but after the long hot dry summer quite a relief. Folks around here are pulling out the owner’s manuals trying to remember how to use their ovens again. These sound terrific! Do you think I could substitute honey for the maple syrup? Believe it or not I don’t like maple syrup–my family thinks I must be the only person on earth who doesn’t like it. I just picked up some cranberries today, so I’d really like to try these. Diana – Yep. Honey instead of maple syrup would work perfectly! cardamom is my all time favorite spice. i’ll be making these tomorrow! I’m actually partial to the maple syrup… that sounds fantastic! I’ve got to get my real maple syrup fix! Yum. What ingredients would you suggest be substituted for the pecans/almonds for those of us with nut allergies? What is Grade B Maple syrup? Mmmm I love granola bars. I’ll have to try this recipe soon. Great photos! Nothing beats homemade. Yours looks so Yummy! Great photos! Will definitely give it a try if I have an oven. I just made mine using chilling method. (http://food-4tots.blogspot.com/2008/10/homemade-snack-bars.html). Both of those look great! I hate HFCS granola bars, but it seems the only way to get good ones these days is to make them yourself! Perfect! I’ve been searching for some good granola bar recipes to make my little junk food addict. Love the seasonal additions! Haven’t seen Nutmeg in ages – I’ve missed it, infact. Love the sound of these. Bookmarked! These sound great! I love the fact that they have alot of the holiday flavors, perfect timing! Would corn syrup be a good substitute for the rice syrup? These look sooooo good! Can’t wait to try them! Thanks! These are deeeelish! I just whipped up a batch in very little time, subbing a few ingredients where necessary: multigrain Cheerios for rice cereal, agave nectar for rice syrup, adding raisins along with cranberries, and some walnuts and sunflower seeds in place of a portion of the pecans. It’s great that they have no oil or margarine, only the healthier fats of the nuts. I love the sweet-salty taste of these bars â€“ part of the lure of preservative-laden storebought ones. No more! I bet my family will love them too. Thanks for posting! Do you bake these at all? It seems like the recipe keeps the oats raw.